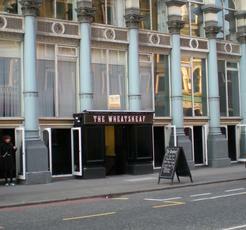 I made a return visit to the Sheaf in November, following a crawl of pubs in the Borough Market area. My experience was very similar to last time, with the place being crowded. Tables had lots of uncollected glasses on them. Ales were Hammerpot Shooting Star, Navigation Patriot, North Cotswold Tumbling Jack, Upham Boomerang & Redcar Golden Ale & Autumn Ale. I recall having the Autumn Ale, which wasn't the best. Or is it? There are now two bars at this address, under this building: the other is the Katzenjammers bier keller. So which was the dive bar in times gone by? My first ever visit to this GBG listed pub that is neatly tucked away underneath the Hop Exchange. Came here to tick it & also to watch the Champions League final. Just before 7.30pm and the pub is pretty packed. Plenty of bar staff on so getting served was not a problem. 10 ales across the pumps, split into 2 lots of 5. I went for pints of Frog Island Lock, Stock, Barrel @ 4.0%, a decent pint and I decided to stay on this for the whole evening. Good manager who gave us a couple of free burgers while the game was on. Decent crowd enjoying the footie, good ales, plenty of choice so the Sheaf is worthy of a 2nd visit.